The south Indian restaurant Sarvana Bhavan in Ilford is one of the cheapest south Indian restaurant's in London according to me. It is about a 5 minute walk from Ilford station. As soon as one gets out of Ilford station exit, they need to take a left and it should fall on the left after about 5 minutes of walk. After entering the restaurant, one is greeted and allocated a table according to the number of people. It is a decently sized restaurant with a banquet facility on the first floor. 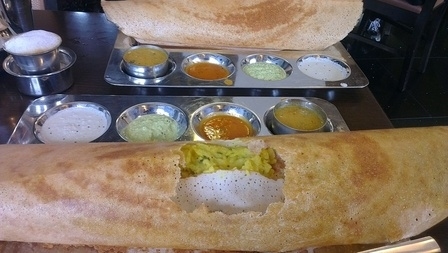 They offer very tasty south indian snacks and meals. 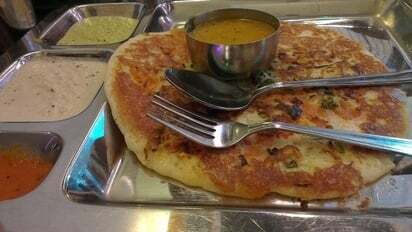 I've had the following : Masala Dosa, plain uthappa, tomato onion uthappa, medu wada sambar, rava onion dosa, besibeli bhath, filter coffee, chana batura (with a huge size batura / poori ), "business meal", most of the north Indian dishes as well. They have loads of dishes. 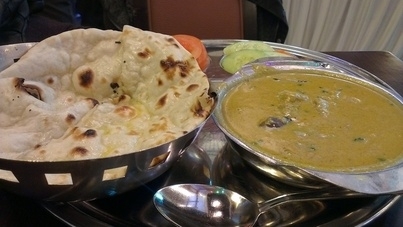 You can find their menu here - Sarvana Bhavan Ilford Menu. The curry in their masala dosa contains nuts I guess. So, they make the masala a bit rich. Their sambar is quite nice. I have heard from my friends that the quality of the food there is better during peak hours than off peak hours due to the fact that, apparently, during off peak hours, the food is prepared by trainees and during peak hours the food is prepared by professionals. However I am not sure if this is true or not. Recently I have seen many caucasians visiting it.